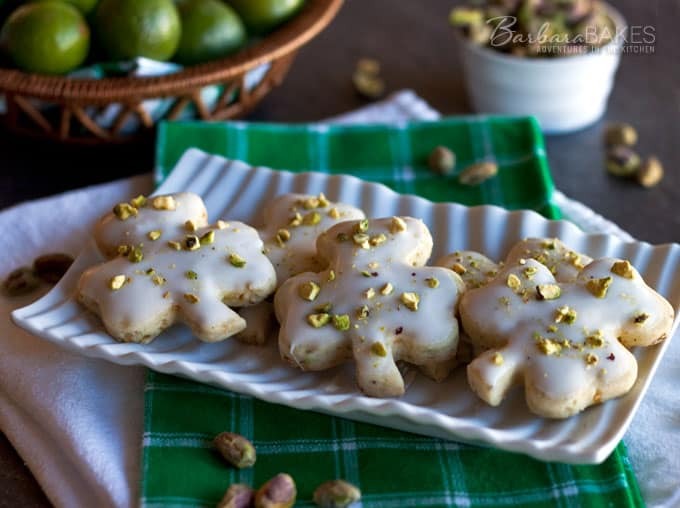 A not-too-sweet, crumbly key lime shortbread cookie loaded with finely chopped pistachios finished with a tart key lime glaze and sprinkle with finely chopped pistachios. 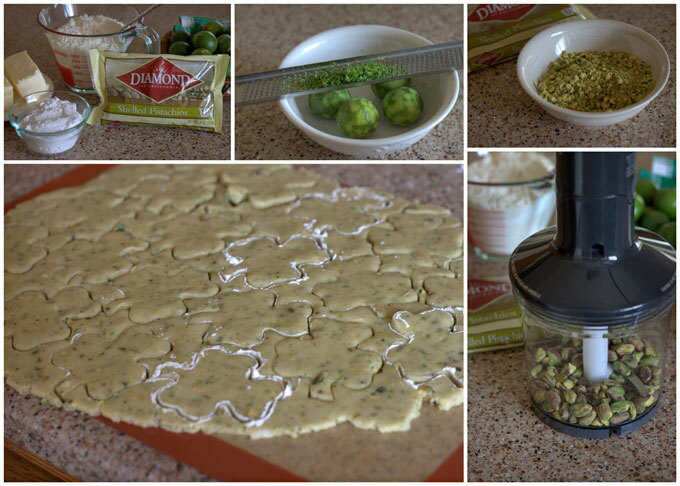 Recently, Diamond Nuts/Diamond of California sent me some of their wonderful unsalted, shelled pistachios, which are perfect for baking, to create a St. Patrick’s Day recipe. I was thinking of fun ways to use the green nuts and remembered the fabulous Lemon Shortbread cookies I made several times last summer. I decided to change if up for St. Patrick’s Day and use key limes instead of lemons, a fun shamrock shape, and use pistachios in the dough as well as to decorate the tops of the cookies. Pistachios are a member of the cashew family and have a earthy, rich, buttery flavor. They add an extra layer of richness and a wonderful texture to this shortbread cookie. I used my mini food processor to finely chop the nuts, but they were also easy to chop with a knife. Dipping the cookies in the glaze is the easiest way to glaze them. Just use a wide bowl, dip the cookie half way into the glaze and let some drip off before putting the cookies back on the cooling rack. Sprinkle on the pistachios while the glaze is still wet so they’ll stick to the glaze. Once you’ve cut the first batch, just gather up the dough and roll it out again and make more cookies. The dough isn’t fussy, and I thought my second batch almost looked better than my first. I thought the white icing really highlighted the green pistachios, but you could add a little bit of green food coloring to the glaze if you want even more green for the holiday. These cookies are easy to make and a fun alternative to traditional sugar cookies for St. Patrick’s Day or change up the shape and they’d also be perfect for really any holiday. In a large mixing bowl, beat butter and powdered sugar until light and fluffy. Mix in vanilla and lime zest. Shape the dough in to a flat disk. Wrap in plastic wrap and refrigerate one hour. On a lightly floured surface, roll out the dough to 1/4 inch thick. Cut the dough in to desired shapes. Place the cookies 1 inch apart on ungreased cookie sheets or cookie sheets lined with parchment paper. Bake until lightly browned on the bottom about 10-12 minutes. Don't over bake. Cool for 5 minutes on the cookie sheet and then remove to a wire rack to cool. Whisk together powdered sugar and lime juice to create a thin glaze. 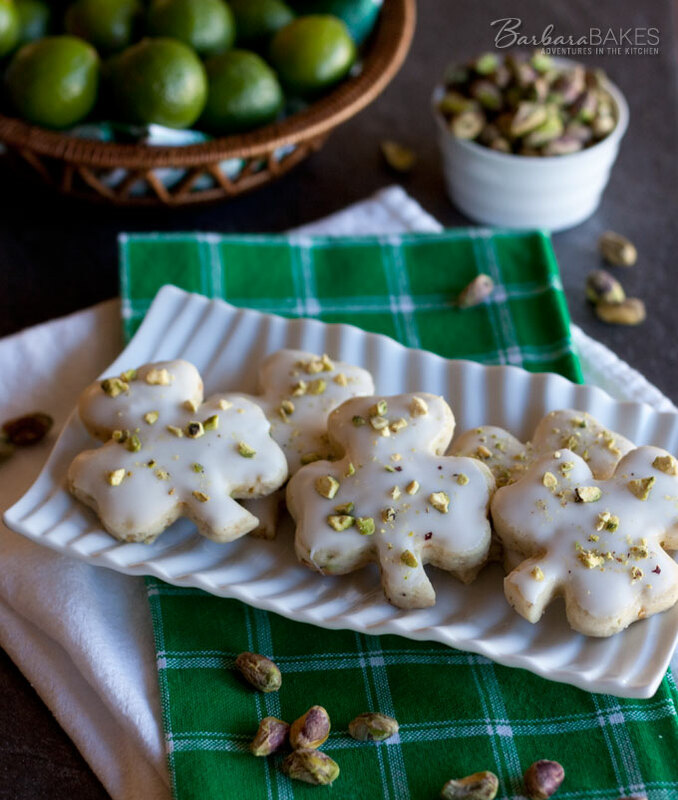 Spread the glaze on each cookie and sprinkle with additional finely chopped pistachios. Disclosure: This post is sponsored by Diamond of California, but all opinions expressed are always my own. You can also find Diamond Nuts on Facebook and Pinterest.